This chilled strawberry soup is a sweet spin on gazpacho. Serve with crème fraiche and slivered almonds on top. This chilled strawberry soup is a sweet spin on gazpacho. Serve with crème fraiche and slivered almonds on top. 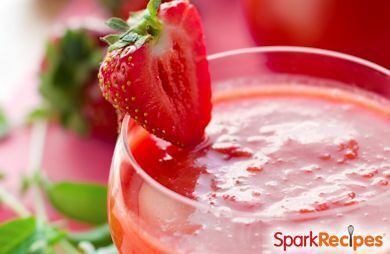 In a blender, combine the strawberries, yogurt, orange juice, sugar, water and spices. Puree until well mixed. Chill and serve. Garnish with strawberry slices and fresh mint.